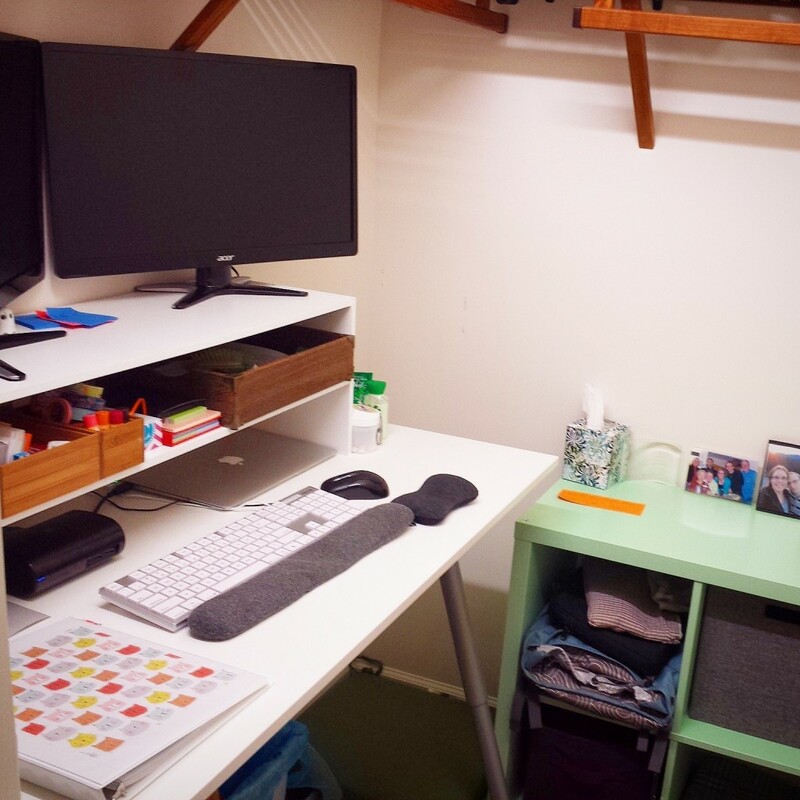 Stand Up Desk – 1 year later! Okay. So for real I will be the first to admit that I had no ambition that I’d still be working from a stand up desk one.freakin.year.later. It’s pretty crazy, right?! I first converted my office desk to a stand up desk in February of 2014. You can read all about that post by clicking here. At the time I didn’t have the ability to purchase a new desk (well – my company didn’t ;)) – so I worked with what I had. I added a shelf on top of the desk (which was still at the seated height), and then I took the doors off of the hutch of the desk and tucked my monitors inside. Trust me. They fit with no room at all to spare. I also added an anti fatigue mat under my feet – which I adore, and it really helps with my feet feeling as awesome as the rest of me at the end of the day! This stand up desk stayed in this exact form until two weeks ago when I left this job. It worked so well for me, and really made me feel awesome. In January 2015 when I took a new position working from home, I knew I wanted a stand up desk still. As I worked on designing my space, the stand up desk became the top priority. Now that I’m (mostly) settled into the new job and the new office, I wanted to share my new setup! I have made a video for you guys with all the details of the new office. 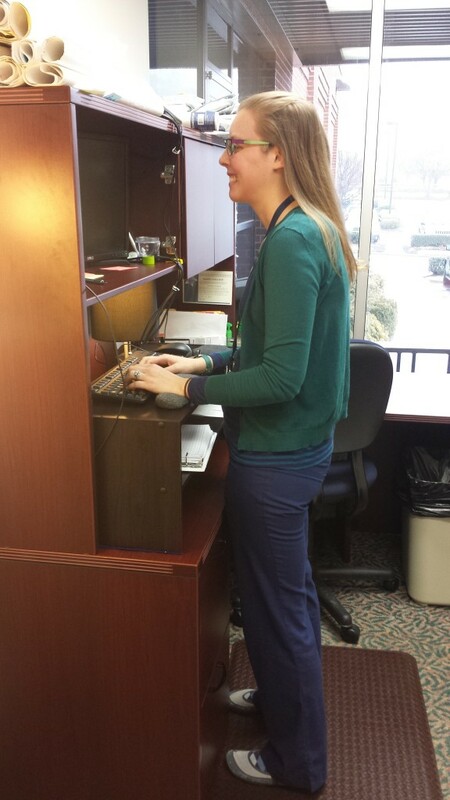 …But first… how am I feeling about the stand up desk, 1 whole year later? Spoiler alert: It’s still awesome. Let’s look at the pros and cons. I’ll admit, I am stealing a lot of these from my post last February. But they’re still so so true. I have edited them for the new adventure – working from home. My posture is much better. When I’m standing, at least. I have terrible sitting posture. At least now I’m not spending 8 hours a day hunched over. I pee more? Sorry if that is TMI – but have you ever been sitting for a long time and suddenly move and realize you have to pee really bad? When I’m standing, I feel the need almost immediately, and am able to go. (Because standing while needing to pee is unpleasant). So much healthier for my poor-not-awesome-at-working-always-like-and-enjoy-making-stones kidneys. Jello – leg – days and Mondays. Hilarious – this was in my “Cons” last year. You know that super sluggish feeling on Monday mornings? After about an hour of stand-up-desk it goes away for me 🙂 I also used to HATE standing after a big workout day when I had jello-ish-legs. Now I am grateful that I move, wiggle, and use my leg muscles, because it means less soreness at the end of the day! If I stop standing for a few days (feel sick, get injured, etc) it takes me about a week to get used to standing and concentrating again. Over the summer I had to have a procedure done and I didn’t stand for a few weeks. I felt like I had to totally reset my training. There is a learning curve. As I mentioned above – concentrating while standing up isn’t easy. You have retrain yourself to do it. When I worked in an office with others, standing made it super easy to get distracted and walk away. I felt like I was constantly “stopping by” my office, and never settling in to tasks. After about 2 weeks of making myself concentrate, that went away. Don’t get discouraged. Push through. It is really difficult for me to sit for long periods now. Be it…a car ride, a plane, a long movie or meeting…my back and neck suffer. I also just get sick of sitting. That’s awesome that you’ve been able to make that set-up work for a whole year! Thanks for sharing and congrats on one year! I’m on year 3 myself. I like the desk you found to use. May I recommend to anyone else looking to convert their desk to a stand up desk to check out a Stand Up Desk Kit from https://standupdeskshop.com. It’s an adjustable, attractive and affordable option that I’ve developed. Pace recently posted…Start off 2015 with standing! That’s so awesome! Three years! Way to go! I love the desk you shared – it looks great!!! !